In early 2015, the Connective Corridor held a $650,000 international public art call, seeking artists to produce new installations for Syracuse. The call received 276 applications from 17 different countries, and an independent jury narrowed down submissions to 16 semi-finalists, then six artists who were awarded commissions. Since then, the Corridor team has been working with the artists, the City of Syracuse, Syracuse University, and private business owners to get all six projects underway. The following is a brief update on three artists and their conceptual proposals. a future update will profile the other three artists who are currently refining their conceptual designs and site locations. 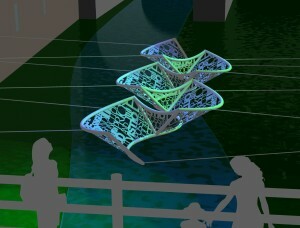 Blessing is proposing a suspended illuminated sculpture over Onondaga Creek in between the SU Nancy Cantor Warehouse and the Creekwalk next to the Marriot Hotel. The proposed artwork consists of a series of curved panels that are arranged into a flowing network of information. The title of the artwork, Current, relates both to the flowing water below, but more importantly to current life in Syracuse. As part of her process, Blessing is asking community members to write short proses, poems, and musings about contemporary and historic life in Syracuse. If you would like to participate you can send your writings to blessinghancock@gmail.com, with the subject line “Writing for Current”, by Feb 26th, 2016. Feedback will be used to create a text surface pattern along the piece. What’s next: Blessing and her engineering/ fabrication teams are working with Syracuse University and the City of Syracuse on the anchoring method for the artwork. 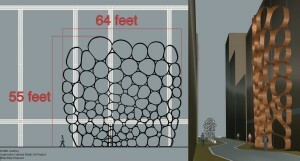 Once plans are finished and approved, Blessing will begin fabricating the artwork and planning the installation. Sam is bringing his Tree of 40 Fruit home to Syracuse in a big way by planting a grove of eight trees in front of the Everson Museum, located at 401 Harrison Street. While reviewing an original set of architectural drawings of the museum, created by the world renowned architect I.M. Pei, it was discovered that Pei initially intended for two tree pits to be constructed along Harrison Street, however only one was ever completed. Almost 50 years later, Sam’s Grove of Trees of 40 Fruit will honor Pei’s vision and complete the second tree pit. What’s next: Sam is working with the Everson Museum, Onondaga County, and design consultants to finalize site plans. 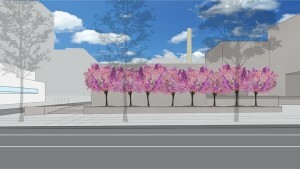 Site work is planned to begin in early Spring, and the trees are set to be planted in October during an optimal planting period. What’s next: DeWitt is working on finalizing the design and the engineering plans for the artwork. He is also exploring the feasibility of up lighting the piece.